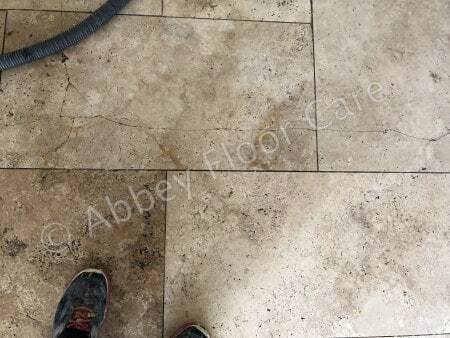 My client had a Travertine tile floor in need of our Travertine cleaning service. 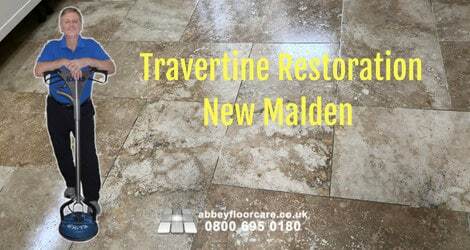 They searched for Travertine Restoration New Malden London and came across our Travertine cleaning and restoration page. I started by applying a heavy-duty Travertine cleaner. The cleaner is gel based and designed to stay liquid for at least 20 minutes. This gives the cleaner time to start softening the soil. I used a rotary scrubbing machine to agitate the Travertine cleaner into the surface of the floor. The scrubbing action emulsified even more soil. I removed the dirty slurry with a pressurised water rinse and capture machine. Clean rinse water is sprayed at 800psi into the surface of the floor. The water rinses away the dirty slurry and pressurised spray reaches into holes that a scrubbing machine cannot reach. I left the floor to dry ready for the next stage, filling cracks in the tiles. As well as cleaning the soil out of the cracks, the cleaning process also removed loose filler that would come away in the coming months. I filled the cracks with a 2 part Jasmine coloured epoxy filler. I filled the larger holes in the tiles with fine Jasmine coloured cement grout. I also used the grout to fill areas of lost grout between the tiles. Once the grout started to dry, I removed the grout residue and left the floor overnight for the grout to dry ready for Sealing. The floor was originally sealed with an impregnating sealer. However, I recommended using a Surface sealer. A surface sealer makes the grout repairs easier to clean. 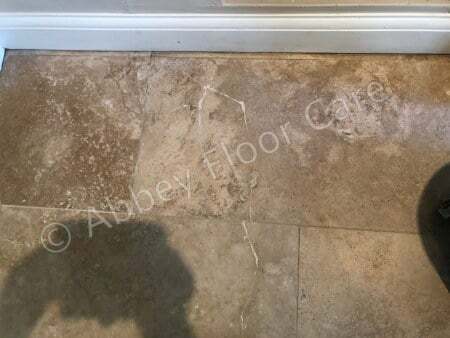 I sealed the Travertine with 6 thin coats of mid-sheen Surface Sealer. 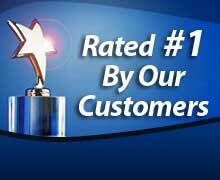 My client was thrilled with the results. 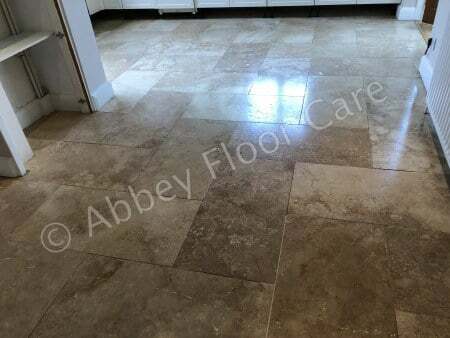 If you are searching for a Travertine restoration service in New Malden, or anywhere else in the UK, please click here to contact Abbey Floor Care. 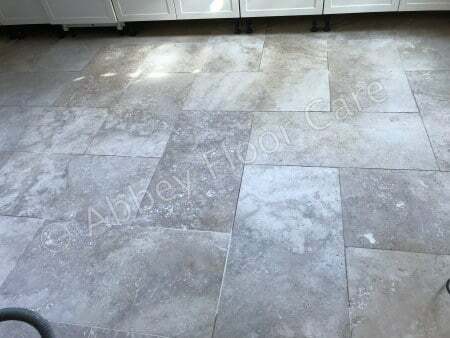 We will be happy to restore your travertine floor to a beautiful, easy to clean finish.